I reached out and found out a bit more about this Wichita based company. Here’s what they had to say about the how, what, and why of the sticker (and t-shirt) business that celebrates the Midwest. KTG: When did the business get started and what inspired it? Heartlandia did not start as a business, but it turned out to be! It started as a way for the talented, mostly young, graphic designers at Gardner Design in Wichita to be part of the Wichita/Kansas/Midwest pride scene that is surging right now. (And may I say – it’s about time!!!) They designed 41 stickers, and while they did not do it as a money-making venture, between Thanksgiving (when the stickers were released) and Christmas of 2017 around 10,000 stickers had been sold, mostly at boutique-style stores in Wichita, Hutchinson and Salina. Stickers, it appears, are a “thing”, especially among young people – they love to put them on their bikes, cars, computers, notebooks. It’s how they brand themselves. But everyone seems to like the sticker idea. For $3 you can tell the world, I love my city, my state, my part of the country! Do you take requests for new sticker ideas? The designs were a result of a brain-storming session the designers had, but we take suggestions all the time (ideas don’t happen in a vacuum), and we come out with new stickers occasionally. Is there a best selling sticker? 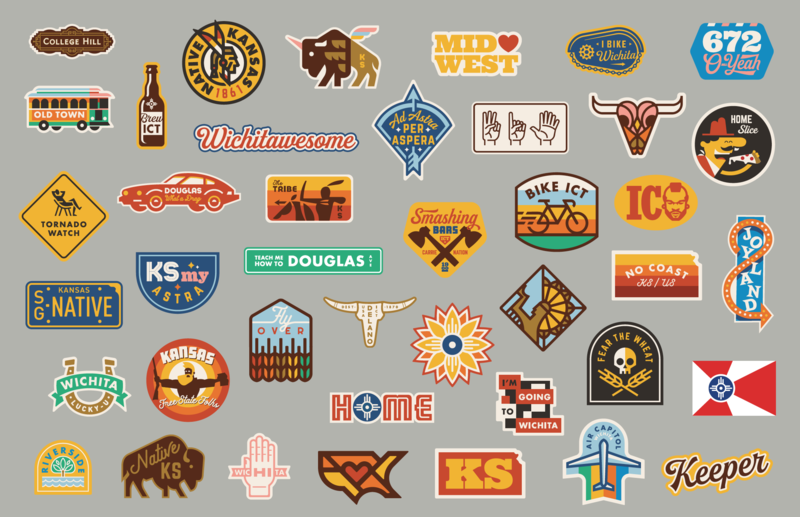 The most popular stickers have been: Tornado Warning, Joyland, Unibuff, Sunflower, No Coast, Ad Astra Per Aspera, and the Keeper of the Plains. Have you ever come across one of your stickers “in the wild” / on a random person’s water bottle or car bumper or bike, etc. We find the stickers in the wild all the time! Many of the orders on our website are from people who now live in other parts of the country, but clearly want to stay connected to their roots by proudly displaying the stickers in their new surroundings. It’s fantastic. There’s a few pictures of stickers caught in the wild on our Instagram account, heartlandiastix. We recently came out with t-shirts with some of the stickers designs, and those have also been well-received. 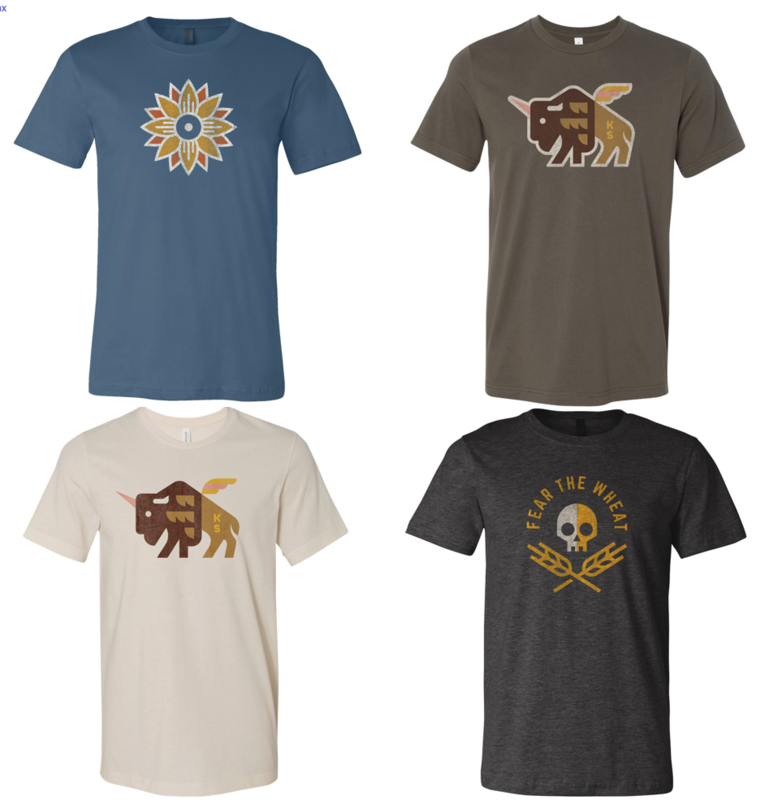 The t-shirts are only available at some of our retail stores: Lucinda’s, The Workroom, Vortex Souvenirs, Botanica, Wichita-Sedgwick County Historical Museum, Watermark Books, Best of Times.